In the new Doug Liman series Impulse, it feels as if Maddie Hasson’s range on camera has finally been found. The 23-year-old actor has already appeared in both network dramas and feature films, but nowhere has she been more captivating than as Henrietta “Henry” Coles, an outcast teenager whose ordeals precipitate a new supernatural power. Hasson brings a complex array of emotions to the screen with Henry, but for her, it’s only the first of many challenges she wants to tackle in her burgeoning career. After her character’s traumatic event, she discovers she can teleport. It’s a sci-fi even the sci-fi averted will be obsessed with. If you were taking a stroll by Broadway and Howard some odd days ago, you would have spotted a platinum blonde, Valentino frothy-red-gown-wearing Maddie Hasson twirling as she beelined for the pretzel stand on the other side of the crosswalk. We managed to lens a few shots before she downed the entire doughy knot. Did we mention this was ~after~ we snuck onto our Coveteur HQ rooftop for an impromptu photo shoot and got kicked off? Yeah, that happened. You know what, though, Hasson was just about up for anything we threw at her, as long as it ended in the right shot. That’s something she has in common with her character Henry—a rebellious 16-year-old who discovers she can teleport during a traumatic assault—in YouTube’s original series Impulse; she oozes confidence. We sat down with Hasson to talk about the challenges of playing her destructive teleport scenes, the importance of exploring the assault throughout the series, and what she’s binge-watching right now. What does it take to be the next big thing? Whether you say innovation, irreverence, or a lot of flash, it’s undeniably the elusive It factor—that can’t-look-away but also can’t-quite-put-your-finger-on-it instinct. And we’re doubling down for It Girl, It Brand, our latest series speaking to who and what are on the edge of being huge. This time around, we found something quite kismet in the pairing of actress Maddie Hasson and the Australian label Albus Lumen. The two have their differences: Hasson is making a name for herself as an on-screen (and style) chameleon of sorts, yet the brand, led by Marina Afonina, has made a solid impression for its consistent, strong message of being laid-back yet refined thanks to Afonina’s structured but non-stiff silhouettes, medley of desert colors, and signature tie belts. The biggest similarity between this It brand and It girl? They both make it all look so easy. “I would probably teleport out of a party to somewhere with pasta,” laughs Maddie Hasson, a woman clearly after our own hearts. Within just a few minutes of meeting the actress, we learn not only that she’s down for a carb-loading session at L.A.’s Gusto but also that she has an affinity for getting dressed up and names Anna Wintour among her style icons (yes and yes!). But it’s not just Hasson’s taste in food and fashion that makes her obsession material—we have to credit the former North Carolina native’s latest on-screen performances for landing her firmly on our radar. While Hasson’s breakout came via the 2014 ABC Family series Twisted, we were introduced to the rising star in last year’s Novitiate as the rule-breaking nun-in-training Sister Sissy (a fantastic and emotional watch we highly recommend). This month, however, Hasson finds herself in a completely different role of note, that of time-traveling teenager Henrietta “Henry” Cole in the YouTube Red drama series Impulse. Hasson’s performance is nothing short of fantastic, proving once again her star power is no flash in a pan. Impulse has all the makings of a great sci-fi thriller—an on-the-edge-of-your-seat plot packed with action—but setting it apart from the countless others is the independent young heroine at the center of the story. It’s that which drew Hasson to the project right away, the opportunity to play a well-written female character who is flawed yet still fully sure of herself—a rare find in Hollywood. “I don’t think that’s something commonly portrayed in young characters, especially young female characters, because people have this misconception that because you are young and a woman you can’t have a good understanding of who you are already,” Hasson says. As such, she praises the writers for brilliantly crafting a 16-year-old who isn’t likable just for the sake of it. Luckily, Hasson is no stranger to an identity change, particularly when it pertains to her own personal style. Looking at Hasson in front of us, polished in classic silhouettes and with sun-drenched locks, it’s hard to believe she went through a “huge” Goth phase. Hasson credits her husband, composer Julian Brink, for her style 180. So in lieu of taking style cues from Courtney Love (her former muse), she found inspiration from Anna Wintour’s uniform: cool jackets paired with long skirts and boots. “I really like being covered now,” she says. “It makes me feel very powerful for some reason.” With warmer days upon us, though, Hasson tells us she is settling into a heavy rotation of lightweight linen dresses—like we said, a woman after our own fashion hearts. The new series Impulse (a sequel to the 2008 movie Jumper) just premiered on YouTube Premium and we caught up with star Maddie Hasson to learn more about her! The 23-year-old actress is best known for starring in the ABC Family series Twisted and for her work in the movie I Saw the Light. 1. Maddie is short for Madelaine and my middle name is Louise. 3. I don’t drink alcohol. 4. I have a whippet named Leo who is also very shy and doesn’t drink alcohol. 5. I got married at 20 (best decision I ever made). 6. I danced competitively as a child from age 8 to 14. 7. I love high waisted trousers. 8. I love Love and romantic movies. 9. Running really calms me down when I get anxious, which is often! 10. Impulse was the hardest and most rewarding job I’ve ever had, and I’m so deeply proud of it. Watch the new series Impulse now on YouTube Premium! Impulse’ star Maddie Hasson joins THR to talk about her new show. “When I first read it, I got this sense of dread that you get when you know you could do something really well, but it’s not yours yet,” Hasson told THR. Maddie Hasson joins THR for another round of ‘Finish This Sentence!’ She talks of her ‘Killing Eve’ obsession, ‘Practical Magic,’ and more! Actress Maddie Hasson says that when she thinks of travel, she thinks of her husband, Julian Brink. “He is very related to travel for me,” says Hasson, 23. “I do all of my traveling with him, including a lot of firsts. 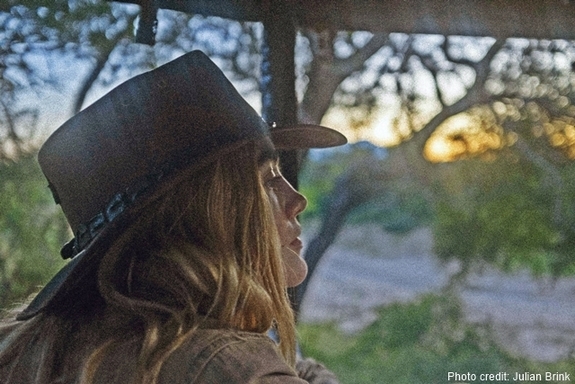 South Africa was the first really different and exciting place I went to and I went with him.” The star of Doug Liman’s highly anticipated new YouTube Red series, “Impulse” — which premiers on June 6th — Hasson keeps fans updated on her work and travels on her Instagram and Twitter accounts. Q. What was it like visiting your husband’s home country of South Africa? A. It was wonderful. I’ve been so lucky, because I got to experience it in a way that a lot of Americans don’t get to do, since I was with someone who grew up there. I went to Cape Town and stayed there for three days. When we go back, I will make it a week-long thing, because there’s a lot to see and it can be overwhelming unless you have a game plan and time. Q. People sometimes say they couldn’t wait to get away from their hometown. How did you feel about leaving Wilmington, N.C., where you grew up? A. It’s one of my favorite places now, but for sure, I had that. When I was 13 or so, I sat on my front porch and just cried and had a full-blown tantrum: “I don’t belong here! I have to get out of here!” (Laughs) (My mother) was a saint. She dealt with a lot from me. I was the worst. Q. Do you enjoy going on road trips? A. I love them. We took a lot of trips to Florida when I was a kid. Because we lived in North Carolina, the place you vacation when growing up on that coast is Florida. It’s a go-to. The last one Julian and I took was to Joshua Tree and it was really cool. We packed the car with snacks and stayed at an Airbnb in the middle of the desert. That was my first time there and it was very relaxing. You could see all the stars. A. I feel like you think that wherever you grow up is the center of the world and that your language is the most important. I think a lot of Americans, especially, have that idea. The more you travel, the more you realize that is so not the case. There’s so much more to be explored and there are so many cultures in the world. Just because it’s different doesn’t mean it’s bad or shouldn’t be respected. It’s really fun to be immersed in a really different culture that you’re not used to. You realize how there’s no blanket normal for how things are done. Q. When you visited Sri Lanka, did you get a feel for what it’s like being a minority? A. That’s a difficult question to answer, because I don’t think I’ll ever understand what it’s like to be a minority. But you are out of the ordinary with fair skin and a hair color that really catches the light. People notice you more. But it’s not anything negative, it’s more curiosity, because (someone like me is) not seen every day. Q. How are you with foreign languages? A. I’m so bad. I’m trying to learn Afrikaans. Julian’s family will speak to each other in Afrikaans when they’re trying to say something so the kids don’t understand, and I can’t play along. I want to learn, but I don’t have an ear for languages. Q. Which city surprised you with its cuisine? A. You know what? Toronto has really good food and I didn’t really expect it. There are incredible restaurants where I’ve had some of the best meals in my entire life. And a lot of people think about London for high tea, and it is really good there. But the best high tea I’ve ever had was at the Belmond Mount Nelson in Cape Town. It was just beautiful and incredible. A. I am an anxious flier. Since I first started taking a lot of trips when I was 16 and flying a lot, I would take this stuffed animal I have named Snowflake — a cat that I’ve had since I was 3. I still take her in my luggage; also, an empty suitcase for souvenirs, so that I can pack trinkets and stuff when I come back home. Q. Many people don’t dress up anymore when they fly. As an actress who’ll be photographed, is it difficult to look put together when you travel? Q. What are some of your favorite cities? A. London, New York, Johannesburg, my hometown of Wilmington. I like Los Angeles a lot now. It’s really easy to hate. It’s very spread out, so you have to find your pocket, which I have done in the last two years. Q. If you had the choice of eating at a street cart or visiting a fine dining restaurant, which would be your first inclination? A. Fine dining. I like to be waited on. I like to feel fancy and put on a pair of fancy shoes and earrings. But I am still a fan of street car food and will eat a meal with sweatpants on. I ate a whole pizza and a pint of ice cream by myself, because I was celebrating. We don’t drink, so I celebrate with food and it was incredible. Eating is so much fun. I’ve started to care less about eating too much or gaining too much weight, which is something you have to worry about as an actress, unfortunately.